One of the original buffer effects, and still one of the best. Replicant is essentially a randomized looper/buffer reverse, with a randomized stutter effect inside the loop. 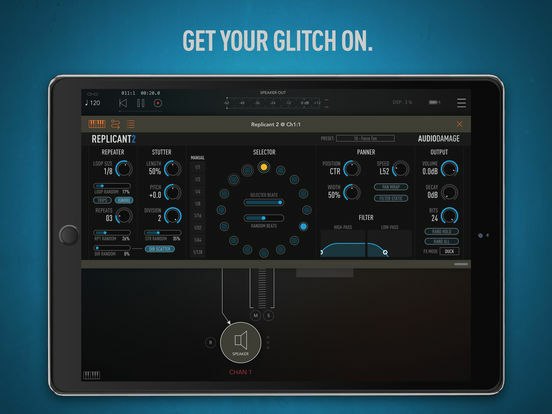 From a simple delay or panning effect, on up to massive random “instant Autechre” beat mangling, Replicant is a capable plugin well in line with today’s electronic music styles. Stuttering buffers and filter drops are easy to program, and the comprehensive randomization features give it a mind of its own, if so desired. If you’re looking to add some chance to your production, you’ve come to the right place! Replicant 2 is a tempo-based effect, and as such it requires a host that provides transport information. You can use Replicant 2 as a standalone application, but it requires an Inter-App Audio connection to a host with a transport to actually work. Audio Damage strongly advise using the AUv3 version of the app instead. Audio Damage also promise that they’re going to add Ableton Link will in the near future for true standalone operation, which of course would be nice. They also recommend you use BeatMaker 3, AUM, Cubasis, ModStep, GarageBand, and other AUv3 hosts that have a transport over using AB3. They’ve also made the app universal, so it’ll run on your iPhone, although the controls are very small, which make me wonder quite why they did it, but on the whole I’m pleased about that. Front panel triggering of loop events for live playing of effects.